1) What are your own origins, Travis? I came into comics in a roundabout way. I went to college for creative writing and science (I think I wanted to be Isaac Asimov when I grew up, Ha!). After graduation I sort of meandered around and tried to write here and there, but ended up not having too much success, which didn't bother me overmuch. I figured it was to be expected and eventually things would work out. In the meantime, I'd take a technical job because the money's ok. Next thing you know, it's been 10 years and you're married with kids and you've stumbled into a career. Ops! For me, I was just kinda pent up a little from not doing much with my creative side. I have always been a huge fan of comics, but I didn't know much about the business of making them. So, I wrote some scripts and set out to find out what I could. And here we are. I've been incredibly lucky. 2) What inspired you to create, ‘Bayani And The Old Ghosts'? Bayani, well before it was Bayani even, started a few years ago when I was looking for some reference images for some monsters for a horror script. Next thing I know I've crawled into this Filipino folklore / myths / legend rabbit hole. I've always been really interested in the usual stuff, Greek and Norse mythology. European style fairy stories and folklore. Even some eastern European stuff. But this Filipino stuff was completely different and some of it was waaaay out there. Some of the best creatures EVER! Anyway, I had been working on a different project with (series artist) Grant Perkins (that other project also coming soon, early 2016!) and he was showing me a few other things he'd been toying around with. One of those things was an unfinished 3 page short written by Andy Lanning (Guardians of The Galaxy) that was a little bit of a play on the Filipino concept of the sun and moon. I loved the art and character designs and he was chomping at the bit to get back into that stuff. I wrote a pitch, a plot synopsis, and a script for a first issue and we sent it off to Mr. Lanning to make sure there were no issues with us kinda picking up on a similar theme. He said it was great, so I went to work, working out the details of the rest of the series and Grant started drawing. Eventually, I pitched it to Caliber, and here we are! 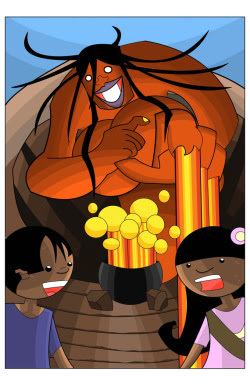 3) Can you briefly tell us what this comic is all about? Bayani, a boy of 11, is desperately trying to care for his sick father (a fisherman) and keep food on the table for his young siblings. Unfortunately, the sun has been shining down on the islands for the last month and night refuses to fall. The land is growing parched from the constant heat and the fish are moving further and further away from shore. During a trip on the ocean in his father's bangka (outrigger canoe) a rare daytime thunderstorm destroys his boat and flings Bayani into the sea. While struggling to find the surface of the water, Bayani is visited by Pati, the God of the Rains. 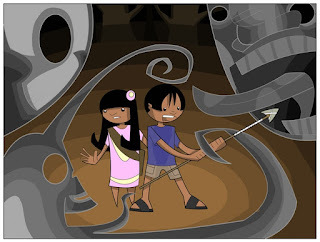 Pati informs Bayani that night cannot fall because the Moon (Mayari) has fallen into deep mourning and will not rise. The Moon's nine daughters had all been kidnapped and needed to be rescued before night would be able to fall again. Pati assigns the task to Bayani. Bayani washes ashore where he's found by Tala, his best friend, and the two of them begin the quest to save the daughters. It's a really fun monster-hunting adventure! It's also a little scary, and hopefully there's a sense of consequence to it. I wanted it to be both friendly and accessible for a younger audience, but also not take the edge off the aboriginal stories that I'm borrowing from. 4) What song would you say best represents your book and why? Well, if I go by what I listened to a lot while I was writing it, I have to say "Mr. Larkin" by State Radio, from the album, Us Against The Crown. The song is about a guy who's wife is sick and dying and how he's willing to do anything for her. It's kind of a sad song, really, but there's a fierceness to the love in it that I think is in Bayani. He's a little boy (and no one loves as fiercely as little boys and girls) who will do anything to help his father and his village avoid death and destruction. 5) If you could get a celebrity – either living or dead – to promote your wares, who would you choose, and why would you want to choose this particular person? Well, in this particular case, I think I'd have to say Manny Pacquiao. I've gotten a really good reaction from some of the Filipino artists that have seen Bayani as it evolved, so that makes me feel really good about it. But it would be awesome for the book to get wide readership in the Philippines. 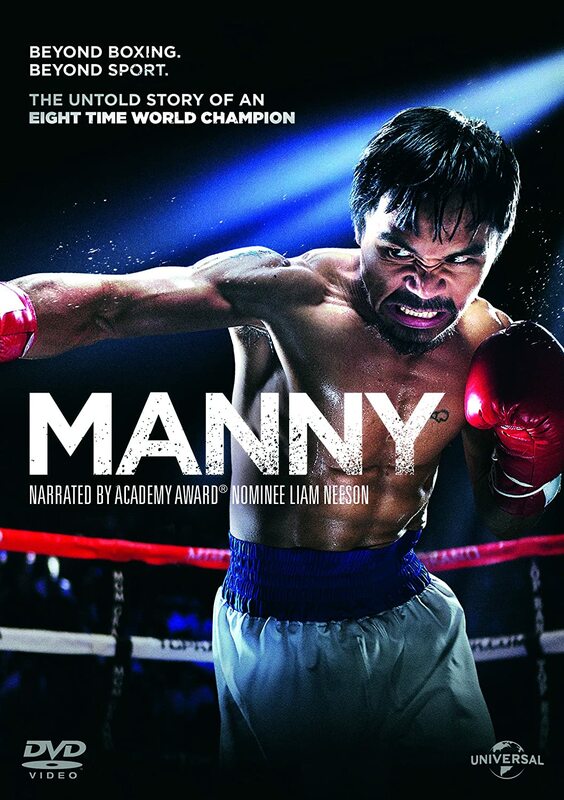 Manny could probably make that happen with one word! For just about anything else, if Tom Waits puts his stamp of approval on something, I'm pretty much guaranteed to buy it so if I could get that stamp, it'd be a pretty big deal for me. 6) What have you learnt about yourself through this endeavour? And were there any unforeseen obstacles you had to contend with along the way? I think a big thing I learned is that I might be a little more well-rounded than I had previously assumed. Chiefly, I consider myself more of a horror/sci-fi writer. Or at least, that's where I'd had some success before. Trying to write something that still has an edge, but is for an all-ages audience was a real challenge. I'm glad I was able to get through it and people seem to be digging it. 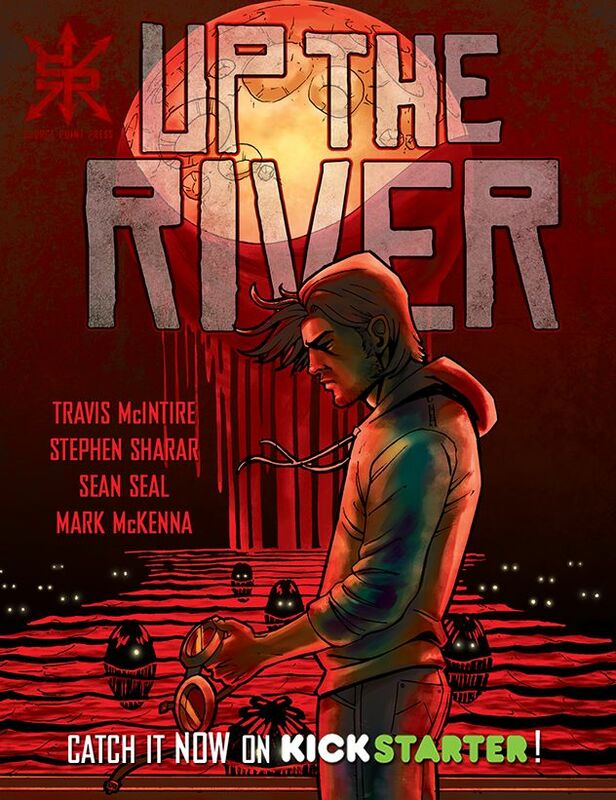 I even got a message on facebook the other day from a guy saying that he really enjoyed "Bayani", but wondered if I was really the guy who wrote (my horror comic) "Up The River?". It was kind of cool that they were so different that someone didn't really think it was the same Travis. In comics, there's always difficulties. It's expensive and time consuming every step of the way. Kickstarters are fairly stressful and take a LOT of time. On top of that, I'm sort of always a little worried that someone is going to stand up and say, "Hey, who the Hell are you to write a story using Filipino folklore? You're not Filipino!". Right now, I feel like I fell in love with the stories and that I tried really hard to treat the culture and myths with respect and tell a story people would like. 7) During your time in this field, what is the one thing that has kept you in good stead? The number one thing is my wife, Laura, and my two sons, Will and Tom. Without her support doing this thing, I'd never be able to have the time to do the convention circuit and write and put together pitches and set aside money to pay artists and all the other never ending things that come up. Number 2 is the support and assistance of the comics community as a whole. 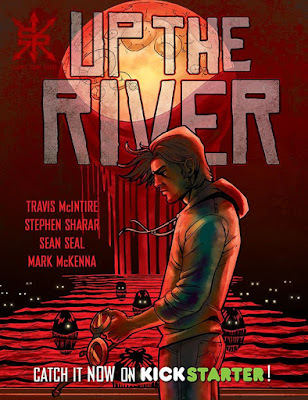 In particular, the Michigan Comics Collective (a non profit publisher I helped found in Michigan) and all the guys at Source Point Press. I've learned a lot about the business and publishing from all of them. Really, the comics scene is a pretty open armed place. You show up with a self-published comic and everybody is glad to see you and impressed that you made it through the gauntlet. It's pretty great. 8) If ‘Bayani’ has a motto, what do you think it would be? That's a good question. It's similar to what a lot of publishers like for you to do. Be able to distill the work down to it's central thrust. I think for Bayani, it's this: The world can be a scary place, but if you take that fear and you mix it up with a little wit and some determination, you can overcome anything. Wow! 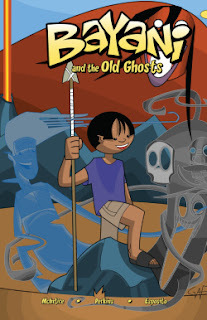 And on that great note, I'd like to thank Travis for telling us about his new comic book, Bayani And The Old Ghosts, before directing you towards his facebook and twitter pages.